The damping of short gravity-capillary waves (Bragg waves) due to surfactant accumulation under low wind speed conditions results in the formation of natural sea slicks. These slicks are detectable visually and in synthetic aperture radar satellite imagery. Surfactants are produced by natural life processes of many marine organisms, including bacteria, phytoplankton, seaweed, and zooplankton. 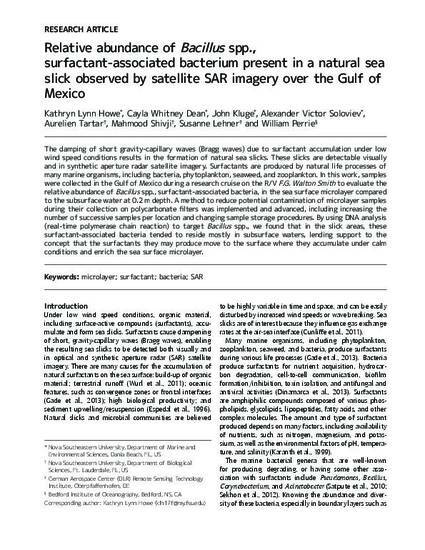 In this work, samples were collected in the Gulf of Mexico during a research cruise on the R/V F.G. Walton Smith to evaluate the relative abundance of Bacillus spp., surfactant-associated bacteria, in the sea surface microlayer compared to the subsurface water at 0.2 m depth. A method to reduce potential contamination of microlayer samples during their collection on polycarbonate filters was implemented and advanced, including increasing the number of successive samples per location and changing sample storage procedures. By using DNA analysis (real-time polymerase chain reaction) to target Bacillus spp., we found that in the slick areas, these surfactant-associated bacteria tended to reside mostly in subsurface waters, lending support to the concept that the surfactants they may produce move to the surface where they accumulate under calm conditions and enrich the sea surface microlayer.